Gentamicin eye drops contain the active ingredient gentamicin, which is a type of medicine called an aminoglycoside antibiotic. 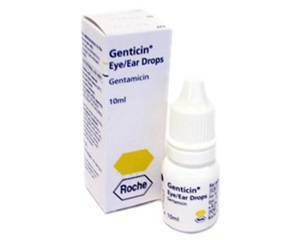 Gentamicin is used to treat infections of the eye caused by a wide variety of bacteria. Gentamicin is a prescription-only medicine. Puss-like discharge from the eye. Gentamicin kills the bacteria causing the infection, which eliminates the symptoms. This medicine is not effective for the treatment of non-bacterial eye infections or viral and fungal eye infections. Wash your hands. Wipe your eyes with a damp cotton wool pad to remove any discharge, scales or crusts. Hold the dropper or bottle above the eye and gently squeeze the liquid onto the inside of the eyelid according to the instructions in the package leaflet. Then press gently on the side of your nose where the corner of your eye meets your nose. This helps to stop the liquid from draining away and keeps it in your eye. Remove contact lenses before using the drops. If you wear soft contact lenses, don't wear them at all until the course of drops has finished. The eye drops may discolour or damage soft lenses. Hard lenses can be worn with the drops. However, you should wait at least 30 minutes after using the drops before putting your contact lenses back in. Always finish the entire course, even if you feel better. Stopping the course early may cause the infection to return. one drop in the infected eye, four to six times a day. Always follow the prescription exactly - never use more or less than the doctor recommends. Read the package leaflet before use. Gentamicin eye drops should be thrown away one month after opening. Blurred vision and/or eye irritation (burning sensation, itching) after using the drops. These symptoms usually go away after a few minutes. Consult a doctor if the side effects are severe or persistent. For more information on possible side effects, see the package leaflet. You are allergic to gentamicin or any other ingredient in this medicine. Check with your doctor before using Gentamicin eye drops while using other eye medication to make sure that the combination is safe. Gentamicin eye drops should not be used by pregnant or breastfeeding women without consulting a doctor first. Gentamicin drops may cause your vision to blur temporarily after you have applied them into your eye. Do not drive or operate machinery until this has worn off. Gentamicin does not interact with alcohol.